Activity is a great way to stay in shape. As you know, it’s the number one recommendation by medical professionals for everything from depression to fatigue to heart disease. It’s great that you dig in for daily walks or are part of a local soccer league, but sometimes that level of activity can take a toll on a body. Sprains, strains, and other injuries often drive people to seek out physical therapy options so they can get back into the game. But what most athletes and gym rats don’t realize is that in addition to injury recovery, physical therapy can also improve performance in just about any activity or workout. Here are a few ways physical therapy can improve your sports performance. By watching the way a patient moves, a qualified physical therapist can identify locations where mobility may be limited. With targeted exercises, you will be able to open up your range of motion and increase your flexibility, allowing you to better protect against injury while simultaneously landing your back handspring. 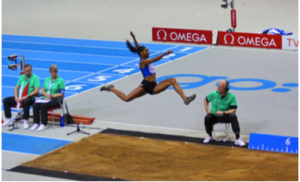 Whether your main event is the long jump or your basketball stride could use some lengthening, a few sessions with a professional therapist can help identify which muscles might be restricting your motion and teach those muscles how to provide more power to the length and height of your jumps. After all, it requires the coordination of many muscles, joints, and bones to propel you into the air and safely land again. While we might not be able to directly improve your cardiovascular endurance, we can help figure out why certain muscles cramp or become fatigued. By strengthening and improving the functionality of your muscles, we can help enhance muscular endurance so that you can finish the marathon or maintain pace on the elliptical machine for the entire length of your favorite podcast. A task as simple as rolling over during a nap requires the use of muscles. In contrast, imagine the amount of use those muscles get during a wrestling match or baseball game. With this focus in mind, strengthening is the best way to get the most out of those muscles so that you can perform at your peak. Physical therapy aims to target those areas that you rely on most so you can bring your “A” game. Without even being aware of it, you can probably identify your spouse, child, or running partner headed down the street at a glance. This is because we each have our own style of movement, called a gait pattern. That gait is a result of all of our body movements working together. 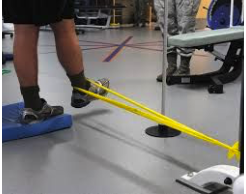 By improving the efficiency of your gait you can train your body to offer you better support and ease of movement, improving your sports performance. Balance is a culmination of multiple bodily functions, ranging from strength, vision, and even the inner ear canals. By performing exercises that target these areas, your balance and stability will improve, which is important in avoiding falls and earning a perfect 10 on your beam routine. Similar to flexibility of the muscles, joint range of motion is a key factor in functional mobility. Consider a golfer that cannot fully rotate on their back swing. Physical therapists can help you identify the obstacles that are limiting your range of motion so you can get that power behind your long drive and improve your game. While injuries are never ideal, those that keep you from doing the sport you love can be life-changing. When you suffer an injury, sometimes your body struggles to get back to where it was prior. Physical therapists can help in this process by identifying where the glitches are in order to get you back on track. Next to helping people recover after an injury, the number one goal in physical therapy is to help people prevent injuries in the first place. Athletes often overlook preventative treatment as part of their exercise regime, yet it can be as important as having the right gear or stretching before a big game. Sometimes the only thing we can do about chronic pain is to minimize the impact it has on daily life. For the active person, this means targeting ways to mitigate that pain so you can continue doing the things that you love. Physical therapy can help discover movements that you should avoid and offer alternative techniques that allow you to play with less pain. Physical therapy is a useful tool for athletes of all levels. From those hoping to begin a new exercise regime to those who have participated in amature or professional sports, Encore Physical Therapy is here to assess your needs and create a plan that keeps you in the game.